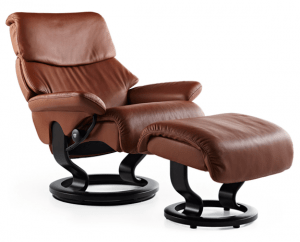 Perfect for any time of day, the Ekornes Stressless Sunrise (M) will remind you what it’s like to wake up refreshed. You’ll instantly relax when you sink into the sumptuous cushion this ergonomic chair designed to fit your body. The Plus™ system conforms to the contours of your body providing optimal support. With comfort and relaxation as the goal, the neck rest and ottoman assure your entire body releases all tension or fatigue. A 360 swivel offers the option to change your view throughout a room. Relax in this meticulously engineered recliner and ottoman from a company who knows the meaning of luxury. The Sunrise (M) is designed to fit average height, weight, and stature. Far from having a generic fit, the Plus™ system responds to the movement and shape of each person. It adjusts as you move to support your back, particularly the lumbar region. The supple head rest makes necessary adjustments to support your neck and shoulders as you settle in to relax. Dropping the headrest allows you to lay almost completely flat for sleeping or resting. A 360 swivel allows you to adjust your position in relation to the room. The ottoman provides support for feet and legs to align your body correctly. The sumptuous curves of the Sunrise (M) offer comfort from head to toe for a person of average stature. Beneath the plush cushion, the Plus™ and Glide Systems are responding to your body’s movement to assure full support. The classic style makes this recliner a fit in any room of the house. We ship to any address in all 50 United States. Ask for details regarding shipments to Canada. For quality assurance, all Sunrise shipments must be insured for accident, loss, or damage. Once your shipment leaves our facility, a tracking number is provided via email. Unless otherwise stated, delivery means “to your door”. Shipments must be signed for by someone over 18 years of age.